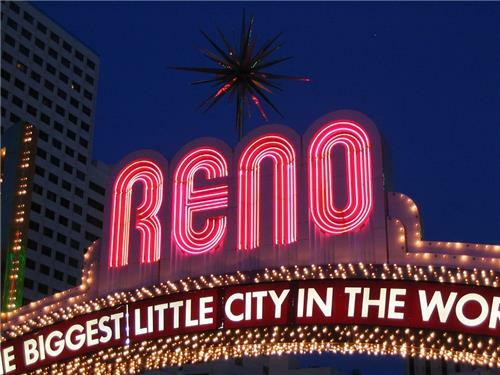 Also called ‘The Biggest Little City in the World’, Reno is the second most popular city in the state for gambling, after Las Vegas. It is located in the American state of Nevada, just 36 miles from the famous Lake Tahoe. The city is known for its several casinos and is the third most populous city in Nevada, right after Las Vegas and Henderson. It is home to a number of tourist spots including museums, verdant parks, botanical gardens and exciting casino resorts. During the year 1859, Charles W. Fuller got a toll bridge constructed over Truckee River to provide easy access between California Trail and Virginia City. This led to a small community that grew up over here to service the travelers. As years passed by, the bridge was sold to Myron C. Lake, who renamed this area as the Lake’s Crossing. During the year 1864, Roop County and Washoe County were consolidated, making Lake’s Crossing the biggest town in the county. Myron C. Lake was then known as the founder of Reno. On 9th may 1868, the town of Reno was officially recognized, when Lake deeded the land to Central Pacific Railroad to construct a depot over here. During the year 1871, the small town of Reno became the county seat of Washoe County. In 1872, the expansion of Virginia and Truckee Railroad to Reno city contributed to its economy and soon thereafter, the city started to prosper and grow as a popular agricultural and business center. During the 1980’s and the start of the 21st century, Reno city saw a boom in the casino industry. Due to its strategic location, the city has also become a popular outdoor recreation center. Situated on the southern side of Truckee River, National Automobile Museum is known for its huge collection of vintage cars, dating from late 19th century to 20th century. Home to more than 200 cars, the museum is divided into four galleries, each of which features cars from different periods of time. Since, most of the collection belongs to a famous casino owner – William F. Harrah, the museum is also known as The Harrah Collection. There are also cars that belong to popular celebrities like Elvis Presley, John F. Kennedy, Frank Sinatra and John Wayne. For more information on the museum, click here. Nevada Museum of Art is the sole American Alliance of Museums accredited museum in Nevada. Home to more than 2000 pieces of artworks that date back to the 19th century, the museum focuses mainly on encouraging interest in the conservation of the land. It is divided into four parts, each displaying works that pays attention to the natural as well as virtual environment. For more information on the museum, click here. Wilbur D. May Center is a popular tourist attraction that comprises of both Wilbur D. May Arboretum and Botanical Garden, and Wilbur D. May Museum. Spread over 12 acres, the Arboretum and the Botanical Garden is open to the public all day and is divided into different gardens, each displaying different varieties of flora and fauna. The Museum, on the other hand, is known for its several collectibles and antiques. It also hosts a variety of exhibitions throughout the year. For more information on Wilbur D. May Center, click here. Constructed in 1910, the Washoe County Courthouse is an important landmark in the city of Reno. During the early 20th century, it played a significant role in Nevada’s divorce industry. The current building was constructed during the 1900’s and was also known its role in Reno’s government. During the year 1986, this building was registered under the National Register of Historic Places (NRHP). Click here, for more information on the history of the courthouse. Built during the year 1908, Saint Thomas Aquinas Cathedral was constructed due to an influx in the catholic population of Reno, who insisted for a larger room. It is the mother church of Reno’s Roman Catholic Diocese. It was restored in 1910 after being almost destroyed the year before. For more information, click here. According to the 2010 Census of United States of America, Reno had a population of 225,221. This city is a dwelling for several racial compositions including White (74.2%), Hispanic (24.3%) African American (2.9%), Native American (1.3%), Non-Hispanic White (62.5%), Asians (6.3%), Pacific Islander (0.7%), Other Races (10.5%) and Two or more Races (4.2%). Reno is in the Pacific Time Zone (UTC – 8). The Summer Daylight Saving Time (DST) is Pacific Daylight Time (UTC − 7). The best time to visit the city of Reno is between the months of April and May and from October to November, when the weather is extremely pleasant and there are fewer tourists. However, summers and winters are also a good time to visit the city, as there are many activities one can take part in. Due to its proximity to Lake Tahoe, there are several outdoor activities that take place over here. Also, keep in mind during weekends hotels increase their prices because several gamblers visit the city on Fridays, Saturdays and Sundays.